FIND THE VOLUME OF THE LARGEST RIGHT CIRCULAR CONE THAT CAN BE CUT OUT OF A CUBE WHOSE EDGE IS 9CM. the height of a solid cone is 12cm and the radius of circular base is 32cm.a plane parralel to base of the cone cuts through the cone 9cm above the vertex of cone .find the area of the base of new cone so formed? HOW TO CONSTRUCT AN ANGLE OF MEASURE 67.5 DEGREE USING RULER AND COMPASS? HOW TO CONSTRUCT ANY OBTUSE ANGLE AND DIVIDE IT INTO FOUR EQUAL PARTS USING RULER AND COMPASS? 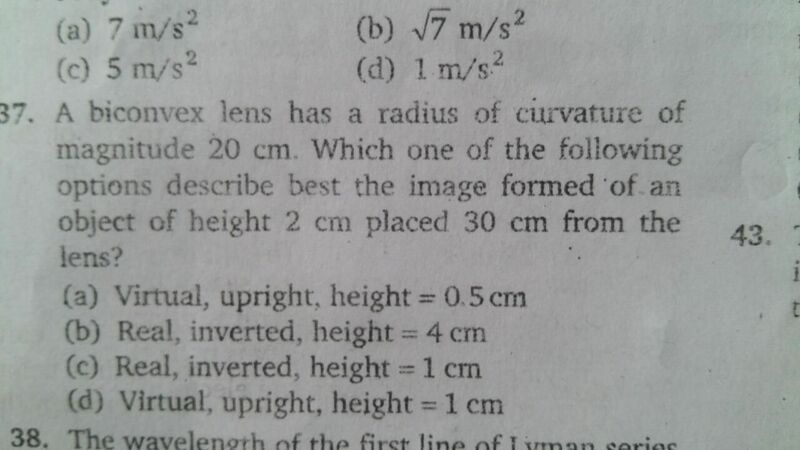 Why do we take radius as half of focal length in this problem ?